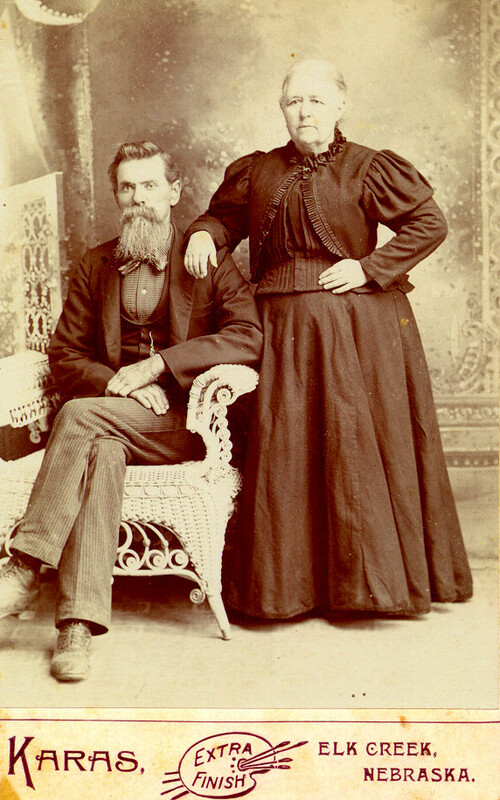 Taken circa 1860, this is almost certainly picture taken on the occasion of their wedding, which was on March 16, 1860. Photo 1804. 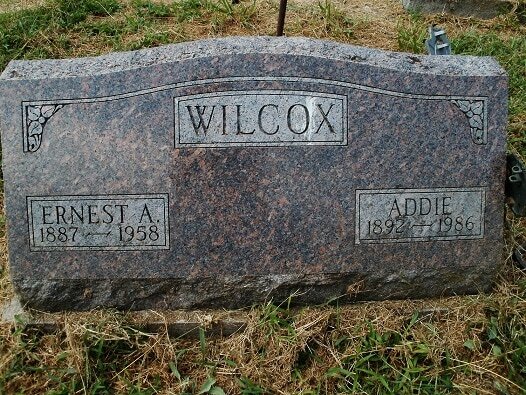 James & Margaret would have at least three children, Jack (full name Albert Jack), Della (full name Evelyne Adele), born in 1865 and 1872, and Willard. 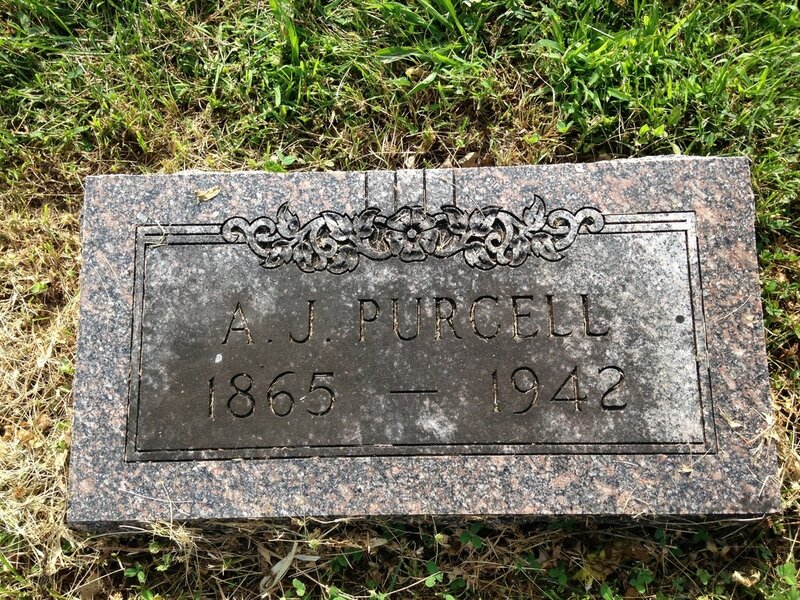 James H. Purcell (1832-1921), shared by descendant Terry Hunt Korrel. Photo 1819. On the right is Margaret (1843-1925), Photo 1807. Above right is Della in 1891, excerpted from a wedding picture of her and Parker McCoy, which ended in divorce. They had two daughters, Ruth and Stella. 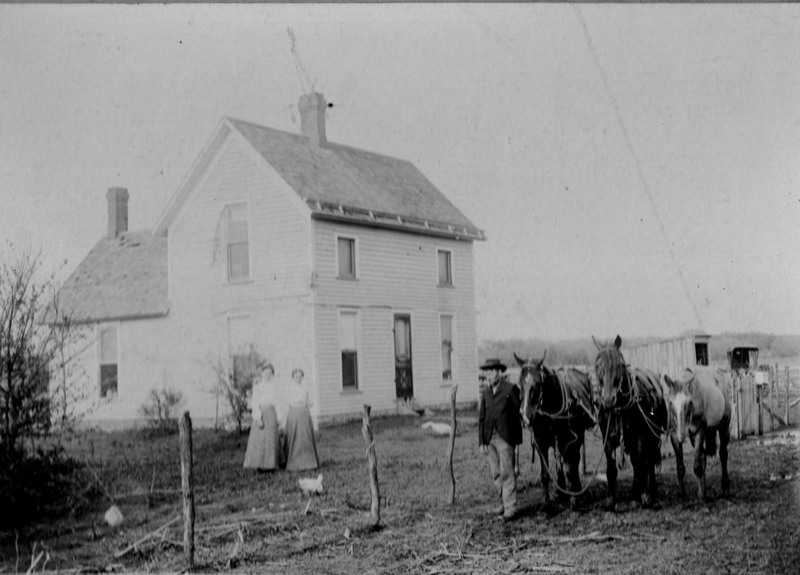 In 1908, Della and her daughter Stella in front of the telephone office in Dawson, where they worked. Photo 1821. Here is a young Albert Jack Purcell (1865-1942), leading three horses. He died at age 77 of a stroke. 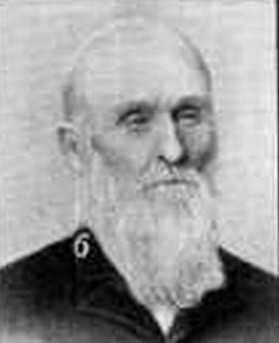 His obituary in the Argus reported that Jack and his wife had a store for many years and also farmed. 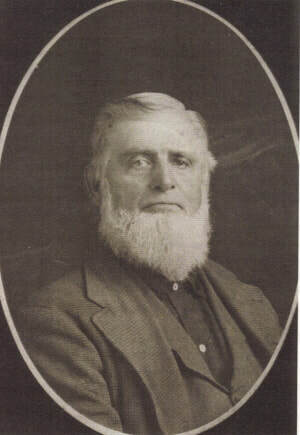 "After retirement five years ago, he still retained his love for stock and gardening, and accordingly had several good cows , a flock of chickens and a good garden. These things were enough to keep a man of his age quite busy. Last Tuesday morning he went out to do a little work in the garden, as was his habit, and some time later he was found dead. What a wonderful place to make the final retirement. In the garden." 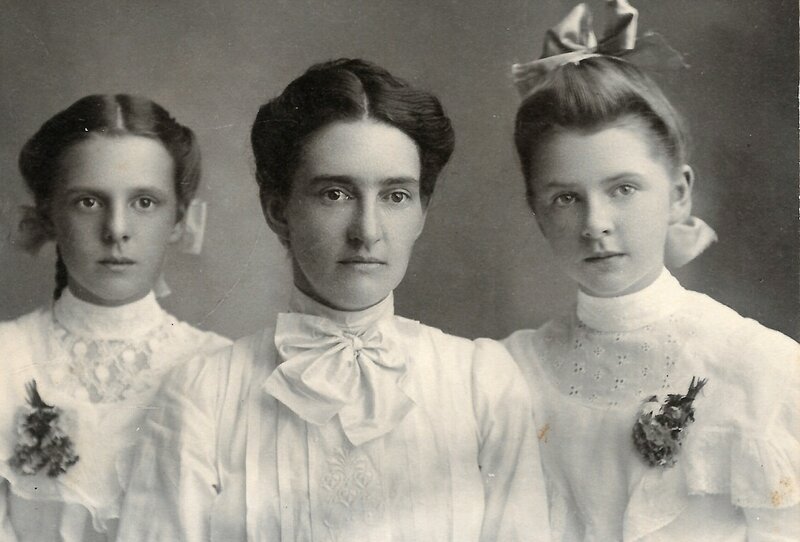 Maudie (1886-1909) is to the right. 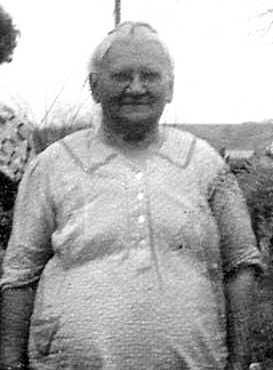 Her cousin Ruth McCoy passed down a photo of Maudie to her daughter who passed it on to her daughter, Historical Society member Terry Hunt Korrel, who shared it. On the back of the photo, Ruth wrote, "Such a sweet girl. 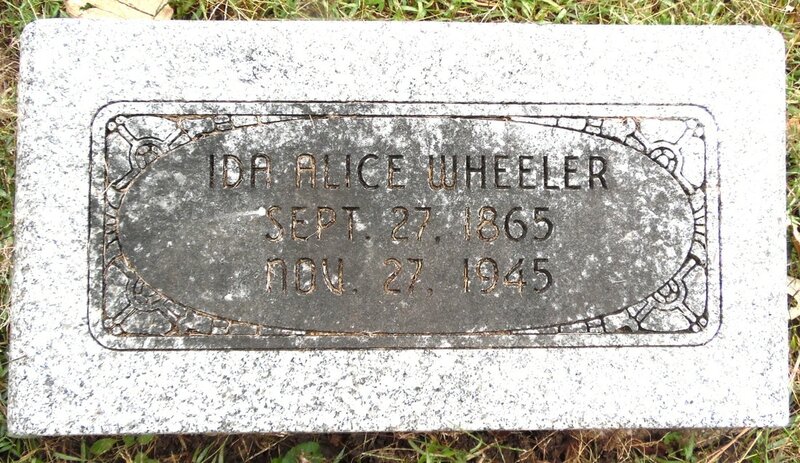 She died at 23 years old of a burst appendix. They operated on her on the kitchen table." 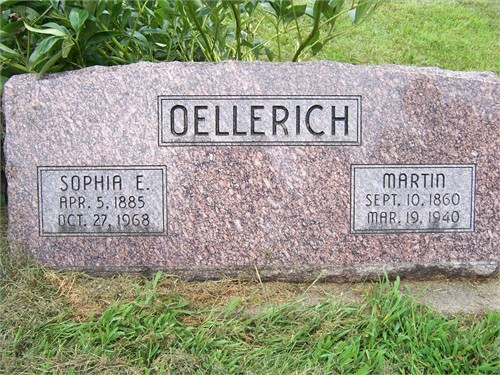 She was an only child. Her obituary in the Argus said, "She was a young lady of many lovable characteristics, devoted to her parents to an unusual extent, and in the home circle she will be greatly missed." Photo 1833. 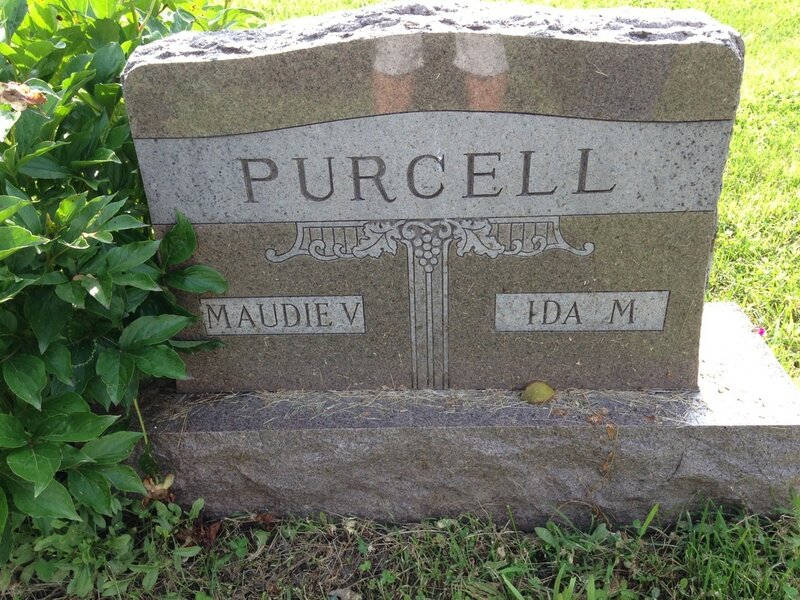 To the left is Maudie's mother, Ida Stewart Purcell (1867-1955). She was Jack Purcell's wife. 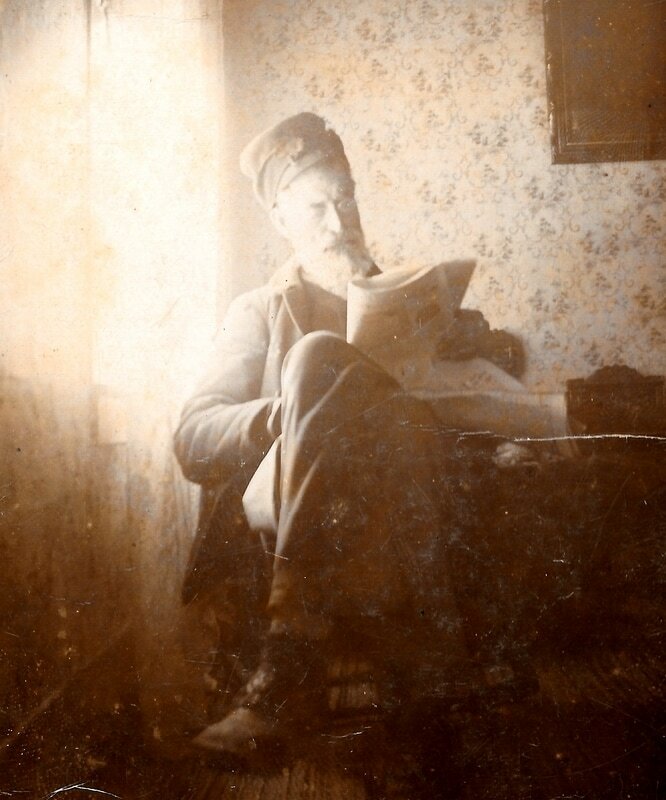 Excerpt of Photo 1833. This lovely photo below of George smoking a pipe is from Historical Society member Terry Hunt Korrel. Behind him: Mary Jane (Sissie) Engberry, Orie Crisler (Maggie's husband), and Maggie Engberry Crisler. Sissie was George's half sister and Maggie was Sissie's daughter. 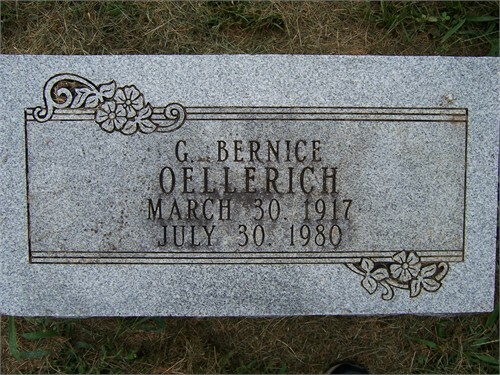 On the back of the photo, Terry's mother wrote: :Uncle George was a real kick – quite a character! He had twinklng blue eyes which sparkled with mischief and – when I knew him – snow white curly hair and mustache. Never without his pipe. In his youth loved to fight and play practical jopkes. Got in a fight with a man about a presidental election. (George was a Republican) and his opponent bit his little finger off! Uncle George won the fight in spite of it all and nearely killed the man. Fell in love with a girl but she married another – so George never married! 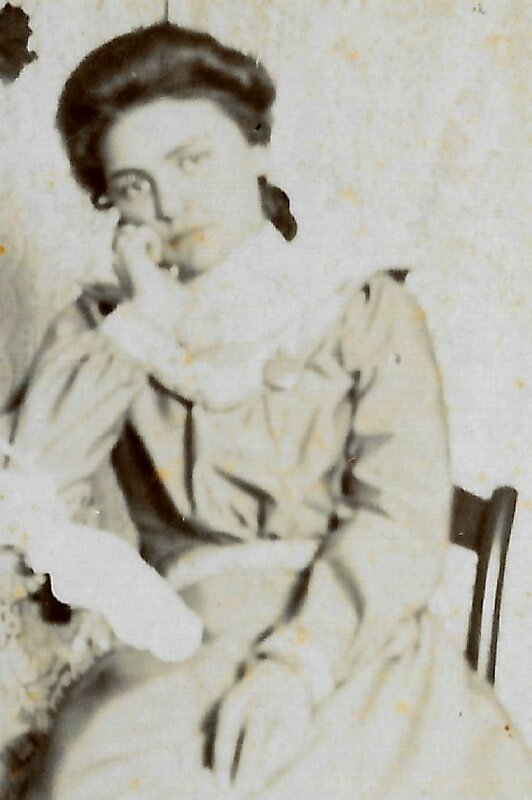 Margaret M. Hunt.” ​Photo 1810. 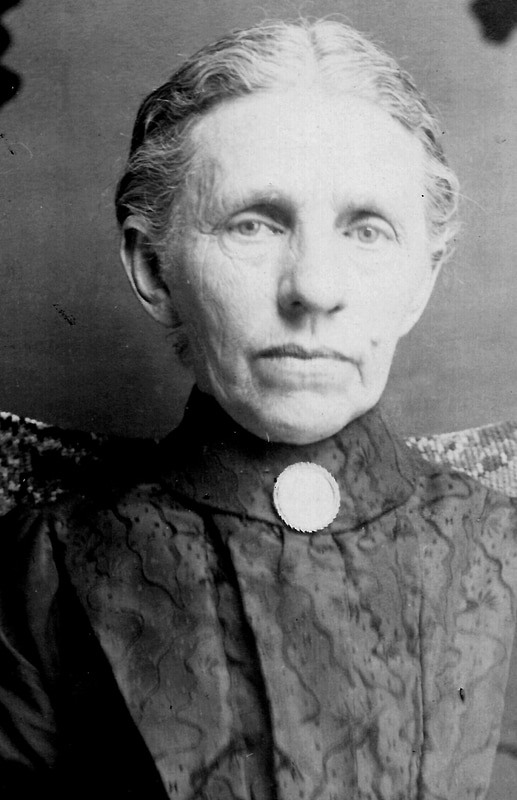 Helen (1868-1904) died at 35, a young mother with children. Here she is as a girl. She was married at 21. 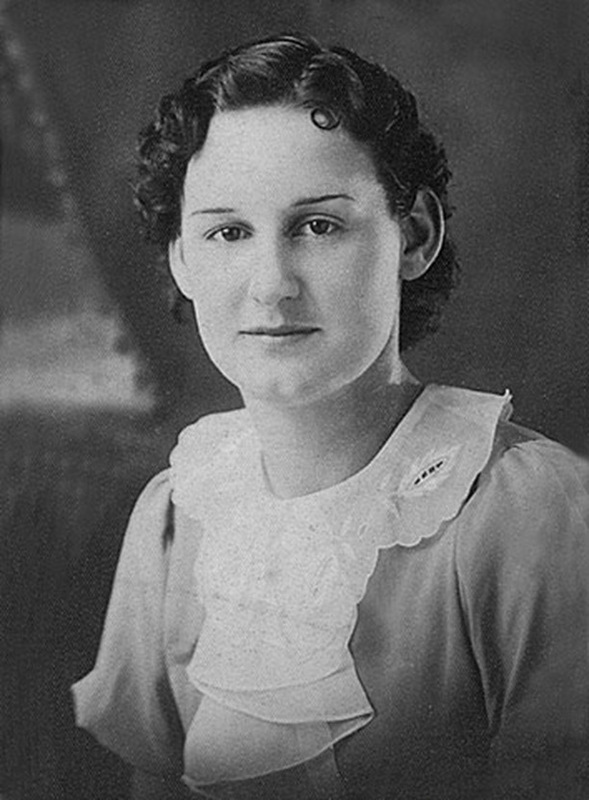 This might be a portrait taken at the time of her wedding. 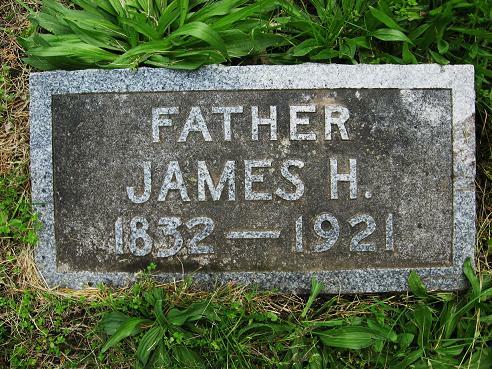 We don't have a picture of her huband Tom (1866-1911), who outlived her by only seven years, dying at age 45. Helen's death was sad. 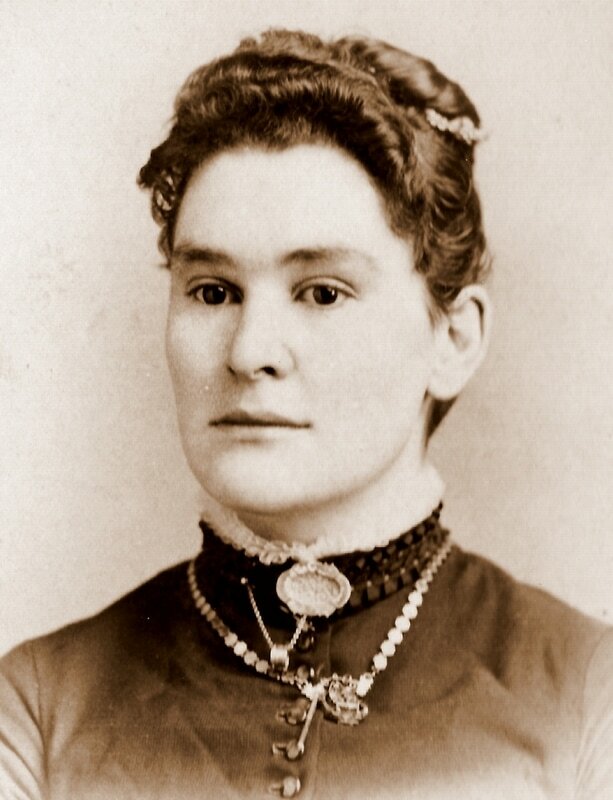 According to articles in the Argus, she and Tom were going to emigrate to Alberta, Canada (a popular destination for pioneers in those days after the American frontier was pretty well filled). 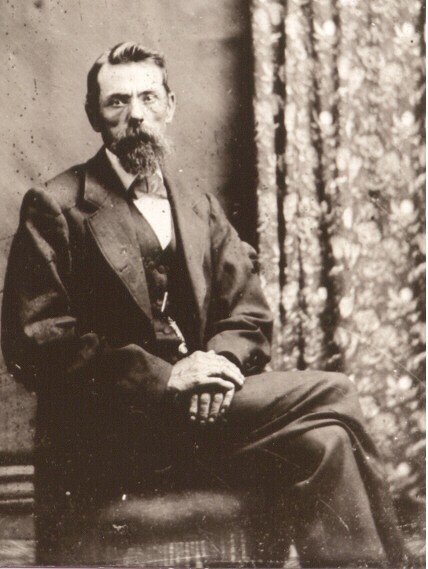 Tom had gone ahead to locate a new home, leaving Helen and their two children in Table Rock. They had most recently lived in Auburn for several years, where Tom was in the grocery business; he had sold out and taken a carload of goods with him. 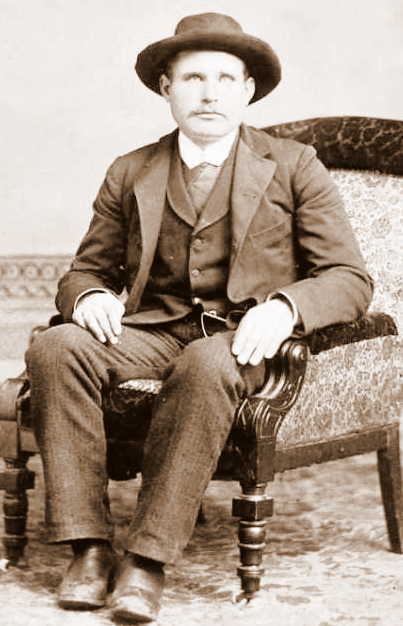 He left Helen and their two children with her parents, the Jesse Fishers. The Argus, reporting while she was ill, related that Tom had written to Helen that he was ready for her to come to Canada. 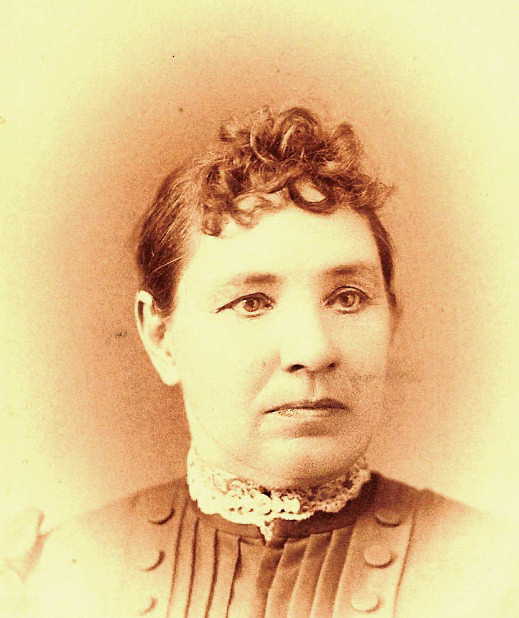 The day before her departure, "she was taken ill, and she rapidly grew worse, and the husband was telegraphed for, but as he was a new man in a new country, forty-five miles from the railroad, and road in a bad condition, the messenger did not reach him until last Sunday." He had started toward Table Rock and was expected soon. The next edition of the Argus reported her death. 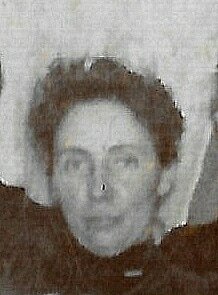 Tom had not known of her death until he reached Auburn, and arrived in Table Rock only in time for her funeral. 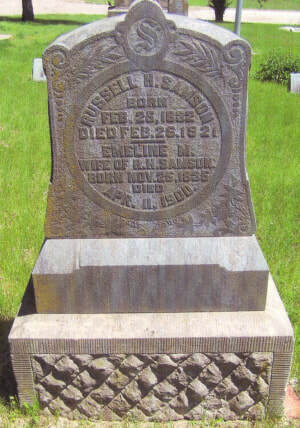 Mary Catherine Donahue -- called Mollie -- was the wife of Emory Samson, who was the oldest son of pioneers Russell & Emeline Samson. 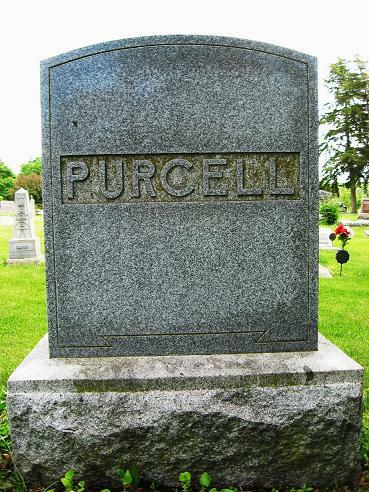 The article about her death says that her remains were brought here to Table Rock. 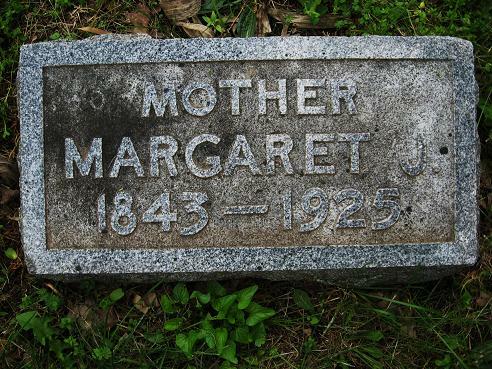 No record of her burial place has been found. 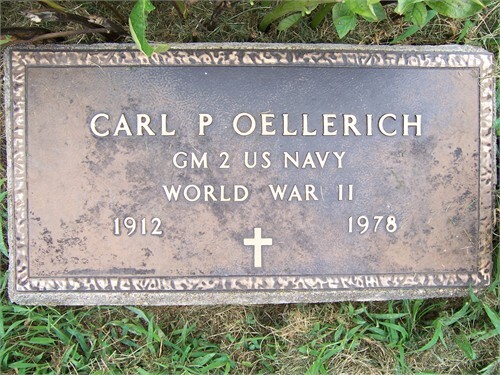 Perhaps they are near one of the empty spots near the graves of her parents. Her name has also been spelled Sampson. Lawrence Wilcox, on his only leave home before going to Korea, where he was killed in action.